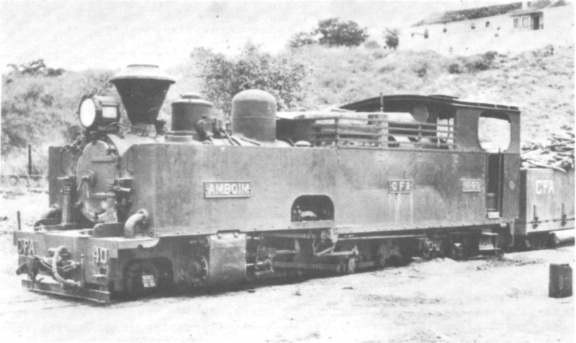 Prior to my visit to Angola in June 1965, I had been able to obtain only scant information about the narrow gauge railways that were alleged to exist. Such entries in the Club’s Overseas Records as “The Engineering Company of Portugal, Amboim – Bagnall 2−8−2 side tanks 2637 and 2638 of 1940” merely pointed the way and that was about all. ‚ However, soon after my arrival in Luanda, I established that a branch leaving the CFA Luanda – Malange line, at a point some 208km from Luanda, was indeed narrow gauge. So off I went on the Wednesday 06.00 train for Canhoca on a voyage of discovery. I was not to be disappointed as here was an active 60cm gauge railway set in delightful surroundings. So we came to Quitongo (19km), and I watched the picturesque train pull away and slowly disappear through the dense foliage. This train doesn’t belong to Africa, I thought to myself. It’s too Germanic – a sort of Jungle Feldbahn! An eerie silence now fell on this clearing in the jungle. Occasionally a brightly coloured bird flitted between the trees. Coconut palms stood aloof and the banana trees were plentiful. As I sat on the rail to await the Canhoca-bound ‘automóvel de linha’, the outside world seemed very remote. Faint noises at first, and then a clearly audible siren announced the approach of “AL 11”, a Perkins-engines Wickham railcar, which I managed to halt at my outpost. The railcar runs a daily return trip from Golungo Alto, primarily for mail. Being the only passenger, I joined the driver for the journey down the winding slopes. Canhoca and its surrounding green hills soon came into view, and after sounding the ‘factory hooter’ for a few wayward natives, we drew up at the platform in good time for the Luanda railcar. After Luanda, my next point of call was the small port of Amboim, some 200km to the south, which is served by the Luanda – Lobito air service. As the next ’plane onwards to Lobito was three days later, I had ample time to explore the 60cm gauge Caminho de Ferro do Amboim (CFA) which runs from Porto Amboim inland to Gabela (123km). 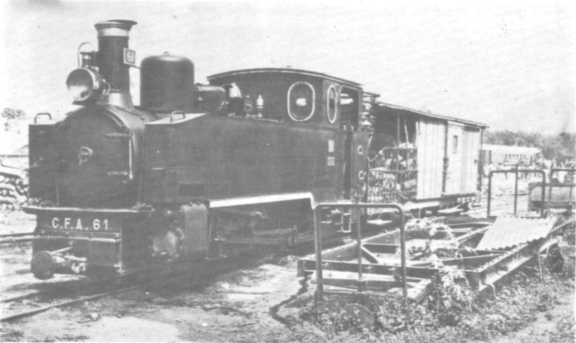 The hinterland is an important coffee-growing region, and it was to serve the plantations that the railway was originally constructed in 1923. 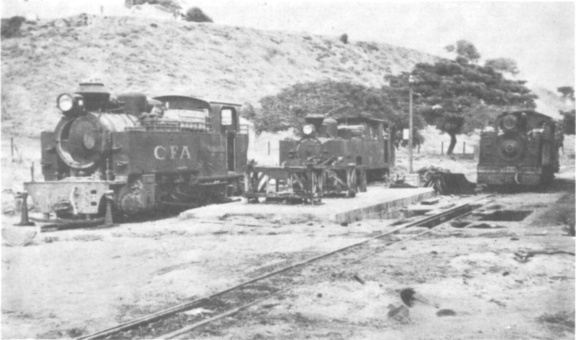 The active rolling stock of the CFA consists of seven steam locomotives and two diesels for shunting the yard and jetty. 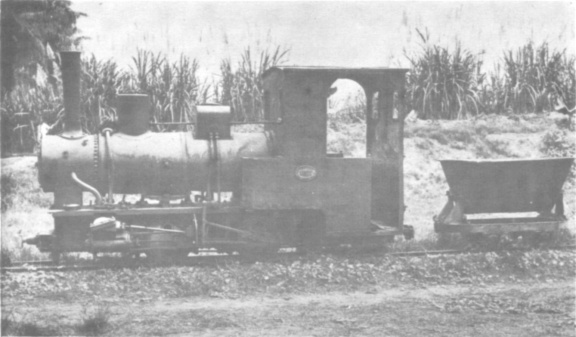 Additionally there are the remains of several locomotives which were used on the construction of the railway. The steam engines are wood-burning, the fuel originating from forests some way up the line, and tenders are provided for the wood and supplementary water supply. There are three petrol railcars, of which two were supplied by Wickham in 1942 (capacity eight passengers). The third came from the “Casa Draisinenbau” in 1952, being powered by a four-cylinder Ford engine, and has a capacity of three passengers. The railways latest acquisition is a diesel-powered Wickham, supplied in 1960, with a capacity of fourteen passengers plus 1,000 kilos of cargo; it is painted green and named BOA VIAGEM.